I know I have invited many people to my blog over the last few days. I came across an excellent resource for additional inormation for friends and family. Please take a look!! Kelle Hampton shares her story on the Today Show on April 11th, 2012. She also has written a book called "BLOOM" One mom's struggle, joy with Down syndrome baby. Thanks Megan for sharing this with me, of course I cried, it's beautiful. It's been a week since we found out about everything going on with Ethan. We have come to a point of acceptance. I am very pleased we found this out prior to delivery. We have time to prepare our selves and meet all the physicians and specialities that will help to bring Ethan into this world as healthy as possible. Down Syndrome (DS) is also known as Trisomy 21. A typical person has 46 chromosomes, 23 pairs. One set comes from Mom, one set from Dad. A person with DS has an extra chromosome making 47 chromosomes. There are 3 copies of the 21st chromosome instead of the typical 2 copies. I like to think of the extra copy as a gift from God. There is no explanation as why this has happen, nothing we have done. Statistically I had a 1:850-1000 chance of conceiving a baby with DS. So truly I believe Ethan is a gift from God. We will be preparred to care for this baby just as we did with Eli. I understand there will be many more chanllenges, but raising a typlical child there are challenges. Our goal is to raise both of our boys to their fullest potential and live a happy life. Here are a couple websites that I have found helpful for additional information. We had our level 2 ultrasound done with Dawn and she pointed out as we knew there were some heart abnormalities. This scan was to measure everything from head to toe. She would continue to take multiple pics of just the heart. We did find out it is a BOY, his name is Ethan Matthew. He is a Wolfe boy for sure, would not sit still long enough for Dawn to get a good picture of anything. The scan took a little over an hour. Immediately after she was done, we waited for Dr. Matt to see us. He came in and introduced himself. He was very kind and straight forward. He personally scanned the baby and viewed images himself and said he had some additional concerns he wanted to address with us. He noted the baby did have a congenital heart defect known as a complete atrioventricular septal defect (AVSD). Then he proceeded to say, unfortunately I am certain your baby has Down Syndrome. Right now he has 3 markers for Down Syndrome (DS), the heart defect (which accounts for 40% of DS), flat nasal bridge, and hypoplasic mid phalanx of the 5th digits of the hands. Everything else check out fine, ventricles in the brain, bones, abdomen, ect. We opted for an amniocentesis. This would give us 100% confirmation of the diagnosis. They needed to do the procedure anyways d/t increased fluid and could not see all the organs clearly. The procedure wasn't bad at all. I've had worse menstrual cramps and those last a ton longer!! So from that point on Matthew and I were in complete devastation. I never heard a single word after the amnio.Every possible thought was racing through my head. 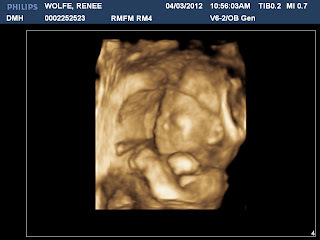 Not to mention the fact our son will have open heart surgery before he is 6 months old if not sooner. I could not stop myself from crying. They were very kind and gave us lots of information, but I was just not ready to hear everything. We will have every 2 week appointments rotating with my primary OB/GYN Dr. Barnhart and then at Riverside. I was given a referral to a cardiologist from Children's thankfully I will see them at the MFM office. We have our next appt scheduled for May 3rd. We will have a fetal echocardiogram and another level 2 ultrasound. Why us, what did we do to deserve this, how are we going to care for this baby and both work full time... It took me many days to get a hold of myself and just grasp what exactly is going on. We have a very strong family and friends. Thankfully we have great doctors that keep in contact with us for any questions or concerns we may have. We will get through this and Ethan will be loved just as a typical baby would be loved. For anyone who may read this. I do want you to not feel sorry for us or Ethan. But to love him and support us throughout our journey. I will continue to post updates through the website, so please feel free to follow and comment. Love you all! !